A recent outbreak of coral disease off Kauai’s shores has caught the attention of federal scientists, who plan to come to Kauai to study the phenomenon in March. Local biologist Terry Lilley sounded the alarm last year, taking photos showing a cyanobacterial disease attacking coral. 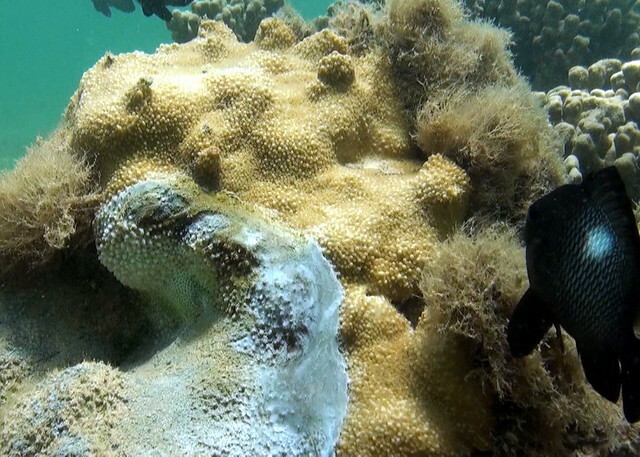 On Wednesday, Dr. Bernardo Vargas-Angel, a coral disease specialist at the National Oceanic and Atmospheric Administration, confirmed that the federal agency has organized a team of scientists to travel to Kaua‘i to continue the study. Specific dates have not been set. In addition, Christine Runyon, a second year graduate student in marine biology at the University of Hawai‘i at Manoa, has been chosen to lead the university’s ongoing investigation of the outbreak. Photo courtesy of Terry Lilley.